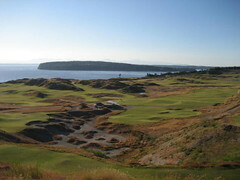 Last Sunday my husband and I went for a walk with our dog by Chambers Bay Gold Course, it's a very nice walk with a gorgeous view. Wouldn't you agree? We have also been bowling on Sunday mornings with a couple of friends (Sandy and Rodney). I have to admit that I am horrible at it, it is a miracle when I can break 100, but I always have a blast playing! We even got our own gear (shoes, bowling ball and bags) and the reason for that is because I just hate renting the shoes and using the house balls... I am concerned that I am going to get some kind of fungus... lol, so having our own things takes care of that.